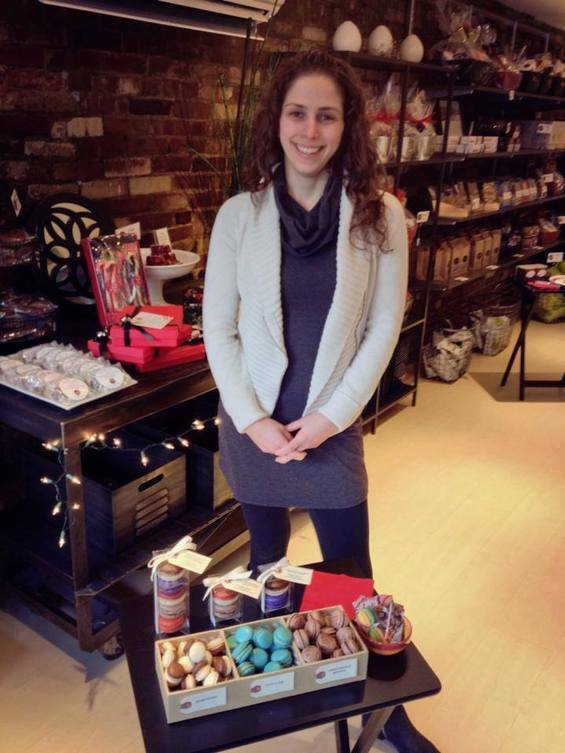 Shira Melen’s day job at EHChocolatier in Somerville sounds delicious enough, but it’s after hours—when the kitchen moonlights as Melen’s Northlight Baking Company—that things really get tasty. Shira’s macarons, delicate French sandwich cookies, come in a wide variety of vibrant colors and adventurous flavors, as you can see for yourself. Y​ou can also taste them for yourself at one of these shops. I asked Shira to define what, exactly, a macaron is (which she did, very appetizingly! ), her flavors, and how she struck out on her own. For the uninitiated readers out there, let’s start with what a macaron is and isn’t. Is it made of nuts? Is it gluten-free? How long do they take to make? And are they any relation to the coconut macaroons we eat on Passover? A macaron is quite different from a macaroon—French macarons are always made with almond flour (finely ground almonds), egg whites and powdered sugar. There’s no coconut involved. They are always gluten-free, so they’re definitely a great choice for Passover and gluten-free folks. They can be filled with jam, buttercream or ganache (basically chocolate and cream that you can flavor). I always use a ganache filling, which I infuse with herbs, spices and fruits, or all-natural things! They take a bit of time to make; you have to start with the shell, and once cooled, fill it with ganache. Ideally they need to “marinate” for at least two to three days, which lets the filling meld with the shell, lending some nice moisture to the cookie. You end up with a nice crunchy shell on the outside and a soft, chewy center. Unlike a lot of other pastries, they are not best when freshly baked. I love the sound of some of your flavors—orange blossom, salted caramel ganache, lavender. Am I wrong in thinking that some of these flavors wouldn’t have been imaginable a few years back? Has our palate changed or was it something else? I think people have certainly become a bit more daring with food over the last several years. Pierre Hermé, who is often referred to as the “father” of French macarons, has done some really unique flavor combinations for many years, so I certainly have been influenced by pastry chefs like him, who like to step outside the box a bit and stay away from your basic vanilla and chocolate desserts. You followed your heart and passion and ended up working at two of the best pastry shops in the area—Sofra Bakery and Cafe and Flour Bakery + Cafe. What’s your advice to someone reading this who wants to find work in this field? My best advice would be to reach out to your favorite bakeries or restaurants. Many establishments are more than willing to have people who are interested in the field come in to see what working in a professional kitchen is all about. It’s very different from how it’s depicted on the Food Network, so getting some real experience is extremely valuable if a career in the industry is being considered. And the bottom line? Always work hard. If you’re committed to and love what you do, it will show in your work. It’s basic cause and effect, really! It’s clear you have a sweet tooth, but what’s your favorite savory dish? I do indeed love sweets (probably too much! ), but I’d have to say that, right now, my favorite dish is probably saag paneer (Indian spinach with cheese cubes). It varies a bit, but I think I could eat it almost every day!